We don't want to make too much out of the Spectrum/Siena poll of the Albany mayoral race that was released Sunday because 1) the primary vote is Tuesday and we'll know who actually won then and 2) it's largely the same as the poll that was out almost a month ago. But looking at the results, the thing that struck us was the sense that people have pretty much had their minds made up for a while now -- even with the 500some* debate and candidate events since the last poll. Also: Whatever the poll results indicate, however wide the apparent margins might be, SHOW UP AND VOTE ON TUESDAY. Local elections don't draw huge numbers of people, which means the votes of a few hundred (or fewer) people can make a big difference. This can be especially true in an election on the level of a Common Council seat in which a handful of votes could determine the outcome. Polls are open from noon-9 pm. Don't know where to vote? Check with the state Board of Elections website. The Siena poll was conducted September 5-7 and included 500 "likely" Democratic primary voters. The margin of error is +/- 4.6 points. 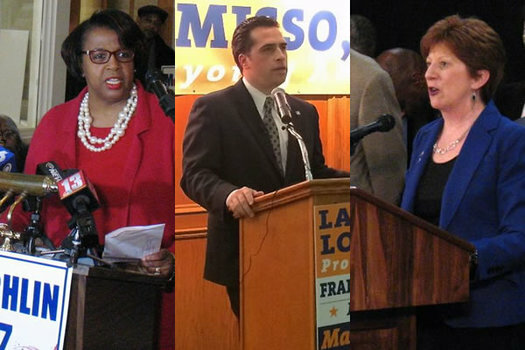 "If the Democratic primary for Mayor of Albany were held today, who would you vote for..."
Elections with incumbents often boil down to essentially being a referendum on the incumbent. It's a don't change/change choice for a lot of people. So when 63 percent of respondents say the city is on the right track -- as in this Siena poll of Albany voters -- that bodes well for the incumbent. The "single most important" issue in deciding on whom to vote for in the primary? * That might be an exaggeration. But it was a lot.